Discussion in 'News - Breaking News & Political Forum' started by nysister, Oct 18, 2018. Kierra Coles, 27, disappeared after being seen on video two weeks ago outside her home. She has not been heard from since, authorities said. On Tuesday, the U.S. Postal Service Inspection Unit announced it was offering a $25,000 reward for help in her safe return. 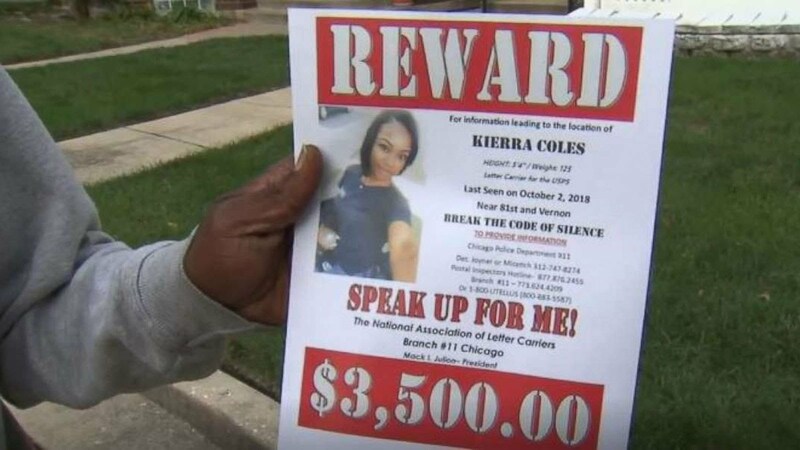 Kierra Coles' father is passing out flyers hoping to find his missing daughter in Chicago. She hasn't been seen since Tuesday, Oct. 2, 2018. A missing person's poster for Kierra Coles, who has not been seen in Chicago since Oct. 2, 2018. Lita, brg240, theRaven and 4 others like this. PRAYING she is found SAFE!!!! Jas123, kxlot79, [email protected]@ and 15 others like this. 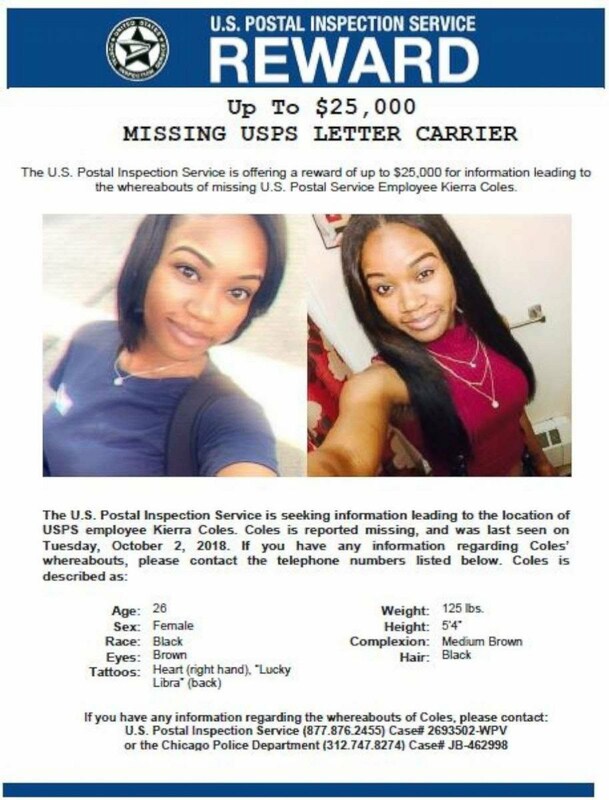 Coles’ family said she has a boyfriend, who’s the father of her unborn child, but they have been unable to contact him since she went missing, WMAQ-TV reported. Jas123, Lita, kxlot79 and 23 others like this. Jas123, lesedi, Farida and 2 others like this. Her boyfriend probably has something to do with it. I pray that she's found unharmed. Jas123, NaturalEnigma, Leeda.the.Paladin and 9 others like this. Aww man... this is awful. Jas123, naaaryeeley, lesedi and 4 others like this. Sad to say but that was my first thought. Jas123, lesedi, prettyinpurple and 2 others like this. Her and the boyfriend are both missing, so is the boyfriend’s family looking for him too? kxlot79, Chipmunk, Bklynqueen and 12 others like this. [email protected]@, brg240, kblc06 and 2 others like this. I think mom knows more than she’s saying. She was the first one to throw out the possibility that Kierra just ran away. Now she’s trying to take the focus off the boyfriend. This isn’t typical behavior for the mother of a missing daughter. If the boyfriend is not involved, then where is he? Him being involved doesn’t mean he’s killed her. Maybe they did just run off, but it’s strange for her mom to flat out say she doesn’t think he’s involved. The mom and sister are also speaking about her in past tense in the interview. The whole interview was strange to me, but I can’t tell if it’s a low IQ situation or something more sinister. Jas123, Kindheart, RUBY and 12 others like this. Okay, I’ve been digging a bit more. It’s sounding like the boyfriend is NOT missing. He’s just not cooperating with the family. He is allegedly married or in another LTR. He may be a postal worker as well. Jas123, RUBY, NaturalEnigma and 21 others like this. This was also my thinking when I first saw the story, I hope she is found safe. Statistics normally show the father of the unborn child have something to do with it. likeacharm, Jas123, Kindheart and 11 others like this. Reads the updates. Remembers BWs matricide rates. What a mess. I hope she is found and its not as its looking. Jas123, kxlot79, Anacaona and 9 others like this. Jas123, Zuleika, Crackers Phinn and 2 others like this. Oh. Kind of as expected. I hope she is found and that she does not end up as Black Girl Tragic but like others have said, it aint looking goo. The police have finally announced that they suspect foul play. Jas123, intellectualuva, kxlot79 and 6 others like this. $10 says that he bd is somehow involved. Jas123, intellectualuva, lala and 5 others like this. Do you have an updated link ? ETA, Never mind I found it. Has anyone seen a recent update? The latest news I see is from a month ago. intellectualuva, Laela, LadyBugsy and 1 other person like this. I pray the family gets some answers, and some closure. CarefreeinChicago and nysister like this. This is so sad. I live in Chicago and have seen her posters up anytime I go to the post office, at a lot of libraries in Black neighborhoods too. It’s so sad. Jas123, prettyinpurple, Laela and 4 others like this. This woman is still missing. I went looking for an update, and saw that they are now trying to find the boyfriend (again) because he moved and vanished. He should have been treated as a serious suspect from the beginning. Jas123, prettyinpurple, CarefreeinChicago and 9 others like this. Jas123, Sanity, lavaflow99 and 2 others like this. I wish that were the case. The update as of today is that they’ve let the suspects get away. I ended up kinda falling down the rabbit hole and watching some psychic medium videos on this. They all say she’s passed on. I hope that’s not true. Two seemed really convincing, but one lady was using an EVP app, which I think is BS. This says a lot right here. I don't doubt it was him. Jas123, prettyinpurple, Kitamita and 2 others like this. This is so frustrating that they took so long to go after the guy that now he is in the wind. smh. It reminds me of story here in Jax. There is highschool girl here that was reported missing in mid Dec. First day was reported as simply missing, then updated to missing and pregnant. A few days later alive, but ran away to the home of a different family member. That was later reported to be a lie by someone in the immediate family and updated to no she is still missing. A week or so ago, they arrested her uncle for an old warrant for sexual battery on another teen girl and only yesterday was it reported that he being considered a lead suspect as he may be the father of the baby. It made me so mad that it took so long to even consider him or push back harder at whatever information he fed them. If that guy wanted to run, he would've had plenty of time to do so. How does a guy with active warrants living in the same house with the missing girl, not be considered the prime suspect?? Jas123, prettyinpurple, Kitamita and 8 others like this. Jas123, Kitamita, nysister and 2 others like this. In the beginning her mom and sister were talking about how they don’t think he’s involved. They were actually upset about how he and his family were being treated by the public. If he turns out to be the one who did something to her, they should be a bit angry with themselves too. They seemed to be or have been fond of him, so they were protecting this man instead of leaving no stone unturned to find their daughter/sister. Jas123, prettyinpurple, chocolat79 and 7 others like this.